This wild and rugged place is full of clues about the formation of the Snowdonia mountains; indeed, Darwin himself visited Cadair Idris to study its geology. 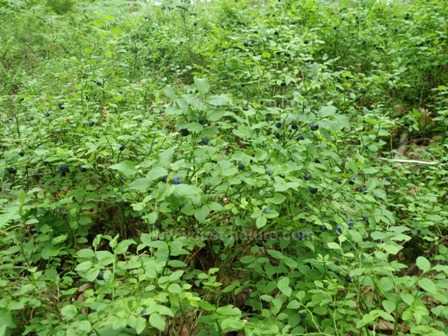 This nature reserve is not just about rocks, however, and it has much to offer bird watchers and botanists alike. For those of us who just love to be in beautiful wild places, the landscape on and around Cadair Idris is some of the most dramatic in Snowdonia. 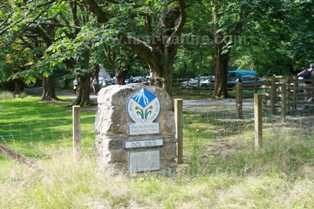 There are several ways to access the NNR from walks up to the summit of Cadair Idris, but the car park nearest to an entrance of the Cadair Idris National Nature Reserve (about a 300 metre walk away) is the one situated behind the Minfordd Hotel on the junction of the A487 Dolgellau to Machynlleth road and the B4405 road to Twyn which passes Tal-y-Llyn Lake. Please note that this car park is variously referred to as Minfordd Car Park (a rather ambiguous name, because there is another Minfordd village near to Penrhyndeudraeth) and also as Dol Idris Car Park. There are other smaller car parks close to the start of walks to the summit of Cadair Idris, but access to the NNR from these points is something like an hour's walk from the car parks. As part of CCW's Communities and Nature programme, partly funded by the Welsh Government with EU support, in February 2011 plans were approved to extend the facilities to include a Tea Room with the exhibition, and this will add considerably to the comfort and convenience of a visit to this lovely nature reserve. Opened in June 2012 the fully renovated Centre has a new interactive exhibit and a Tea Room. Apart from offering drinks, sandwiches and snacks to be eaten at the cafe itself, there are plans to offer 'pick and mix' items to make up picnics that can be taken for walks to the summit, or to be enjoyed in the lovely park area adjacent to the Visitor Centre itself. The Centre is around 250 metres from the main car park. There is a toilet block in the main car park, and further toilets in the newly renovated Visitor Centre. 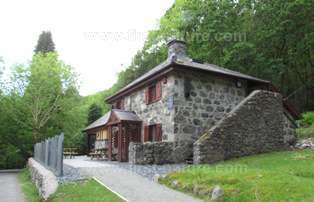 At the summit of Cadair Idris there is a large shelter which can accommodate about 30 people. A network of paths leads to the summit of Cadair Idris. 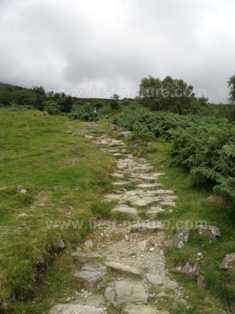 These paths are all steep, rocky and can be slippery in wet weather. There are also gates and stiles along the routes. Even in summer the temperature at the top of Cadair Idris can be several degrees lower than in the car parks. Low cloud often covers the summit, so you can be damp as well as cold - so be sure to take suitable clothing with you and to wear good walking shoes. You will also need to carry water and food with you. Amazingly, a man on horseback used to make a daily trek to the summit with food and water for visitors to the site, but those days are long gone. A job vacancy, perhaps? A good average time to walk to the summit is around two and a half hours. Although the walk back down slopes in the right direction, care still needs to be taken because of the rough, uneven nature of the paths and so plenty of time should still be allowed for the return trip. There is an excellent book edited by Peter Rhind and David Evans and entitled The Plant Life of Snowdonia, in which a part of the northern slopes of Cadair Idris is described as being "the nearest thing to a fern paradise in Snowdonia". For those interested in plants in general (not just ferns!) the whole area is indeed a paradise. But, let's deal with what is below and frequently sticking up from the ground. The mountain of Cadair Idris is composed mainly of Ordovician igneus rock, and the glacial erosion features are similar to those found in other areas of Snowdonia such as Cwm Idwal - striated rocks, accumulations of rocks and boulders called moraines and cwms - basin shaped structures ground out by the retreat of glaciers at the end of the most recent of the ice ages around 12,000 years ago. 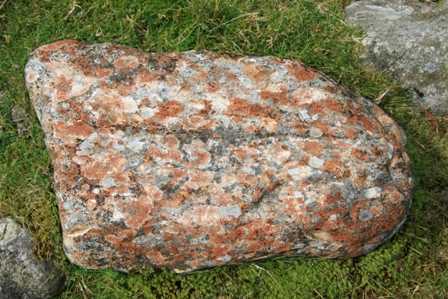 Snowdonia is also a paradise for those interested in geology. And then there's mythology, too. There are several theories about the origin of the name, Cadair Idris, which, when translated into English, means Chair of Idris. The best known of these relates to Idris Gawr, King of Meirionydd (c.560-632), a giant from Welsh mythology who is said to have used Llyn Cau (a mountain lake en route to the summit) as an enormous armchair from which he gazed at the stars. There are other rather more gruesome legends involving packs of howling hounds in pursuit of men's souls; it's probably not the best topic to think of as you embark on a day of gentle botanising! If you walk from the Ystradlyn Exhibition Centre - a wildlife haven in its own right, since rare Lesser Horeseshoe bats (Rhinolphus hipposideros) use its roofspace for roosting and raising their young - you will ascend through the U-shaped Tal y Llyn Valley and into a hanging valley in which flows the stream that pours into Tal y Llyn lake itself. The moisture in this wooded gorge is held there by the tree canopy, and it is home to many species of woodland birds including summer visiting Pied Flycatchers (Ficedula hypoleuca), Spotted Flycatchers (Muscicapa striata), Redstarts (Phoenicurus phoenicurus), and Wood Warblers (Phylloscopus sibilatrix). There are also ferns growing in the rocks and lichens on the trees. Dead trees deliberately left in this woodland provide homes for insects and fungi, and the bats hunt here for the many small insects that thrive in this type of humid environment. In this lower part of the walk there remains evidence of the ornamental gardens planted when the land was still part of the Idris family estate. American Redwood trees, one of the introduced species, are still present today. 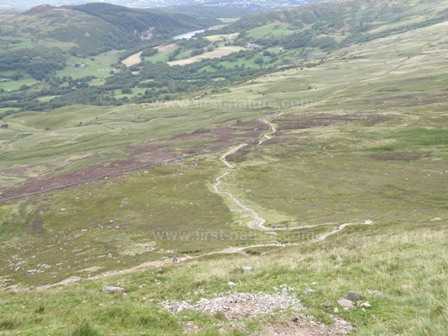 In this area of gentler slopes there is both blanket bog and dry heath. The term blanket bog is used to describe a wet, acid terrain that is low in nutrients and so attracts its own particular plant life. Along with mosses, carnivorous Sundew - both Drosera rotundifolia and Drosera intermedia have been recorded at Cadair Idris - and Butterwort (Pinguiclula vulgaris) grow in these conditions, having adapted to get much of the nutrients they require not from the soil but from insects which they trap, dissolve and then absorb. Dry heath, on the other hand, has a water table that is well below ground level, and this is where various heathers and, in this case, Bilberry (Vaccinium myrtillis) grow. Higher up in the mountain crags, arctic-alpine plants such as Alpine Saw-wort (Saussurea alpina), along with pretty pink cushions of Moss Campion (Silene acaulis) and Parsley fern (Cryptogramma crispa) grow in places too inaccessible to be grazed. More common and familiar plants such as Welsh Poppy (Mecanopsis cambrica) and Thrift (Armeria maritima), normally associated with lowland and coastal habitats, grow in this surprising location too. It would seem safe to assume that these Welsh Poppies are truly wild, whereas the ones found lower down could so easily be garden escapes! Other notable plants that grow in this part of the reserve include Starry Saxifrage (Saxifraga stellaris), Green Spleenwort (Asplenium trichomanes-ramosum), Lemon Scented Fern (Oreopteris limbospermum) and Fir Clubmoss (Huperzia selago). The next stage of your climb may require lengthy pauses to search the horizon for some of the mountain birds that make their homes in this inhospitable place. Look out for Pergrines (Falco peregrinus), Choughs (Pyrrhocorax pyrrhocorax) and, most excitingly, Ring Ouzels (Turdus torquatus) all of which have been recorded here. The Ring Ouzel is a type of blackbird, but itis easily distinguished by a broad white band at the base of its neck.